Two plans are under consideration to limit the Yellowstone bison population but end the periodic mass slaughters. Montana ranchers want to “hunt” the lumbering bison, even inside the park. The USDA, meanwhile, is trying out a one-shot chemical constraceptive or castration. Either way ranchers get what they want: fewer bison and therefore no reason to tolerate wolves. MT Gov. Brian Schweitzer wants to “hunt” the bison. “These things have to have some give and take,” he told the AP. By that he means, that the park boundary should be considered inviolate as far as bison getting out, but more flexible about hunters coming in. A park spokesman told Brown, who did a great job investigating the plan, that they wouldn’t allow hunting within the park–even though that’s what the plan said. Meanwhile, the USDA, whose Wildlife Services unit kills wildlife for farmers and ranchers, is finally thinking about a contraceptive. GonaCon works with one shot, well, mostly. And it curbs ovulation, estrus, marking and the urge to mate as well as the ability. Contraceptive in general is a better approach than the mass slaughters we’ve seen in recent years, with bison rounded up or shot just beyond the park boundary, if they migrate out for the winter. But Stephany Seay, media coordinator of Buffalo Field Campaign, told The Atlantic that it’s all still a manipulation of a wildlife species to accommodate ranchers. “Brucellosis is being used as a tool to manipulate the movement of wild bison,” she said. 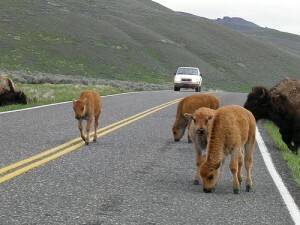 Ranchers hate bison because they compete for food and may spread Brucellosis, a disease that makes cows abort fetuses. But they are noticeably less concerned about the brucellosis brought in by the elk, which they feed and like to hunt.